Jeanne was born in Anjoú, France, the youngest of twelve children. Her father was a draper, her mother ran a shop selling religious goods to pilgrims to a local shrine of the Virgin Mary. Throughout much of her childhood Jeanne was described as very selfish, bad-tempered, egotistical, thinking only of herself. She took over the family business at the age of 25 after her mother died. She grew the business, provided accommodation to pilgrims who were visiting the shrine, and, controversially, opened her shop on Sundays. On Pentecost 1693 Jeanne met a widow and pilgrim who predicted that Jeanne would one day spend her life caring for the poor. Though Jeanne, and everyone else, was skeptical, time passed, and she did indeed begin caring for orphans and living a spiritual life. She closed the family business and gave herself fully to caring for the poor. Jeanne founded the Sisters of Saint Anne of Providence of Samur. She died on 17 August 1736. 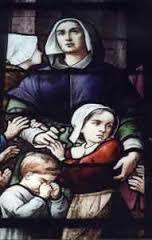 At the time of her death there were twelve communities of her sisters spread throughout France, serving the poor and needy. She had also founded a number of homes for the poor and schools. Today, there are 400 sisters in France, Madagascar, and Sumatra.